Welcome back to the 2nd This Homeschooling Life link up, a place where home educating bloggers can link up posts on the things they have been doing over the month to give each other, and anyone else interested, a little insight into the things they do. The last month has been a bit different for us due to going away twice in the first half then not having a car for the second half. Not having a car where we live in a bit of a problem, not so much because we are remote, there is a high street with some shops, but there aren’t any home ed meet ups in the town where we live so we’ve missed some of the ones we had started going to. Luckily the weather has been nice though so there has been lots of playing in the garden and lots of crafting / art activities at home. 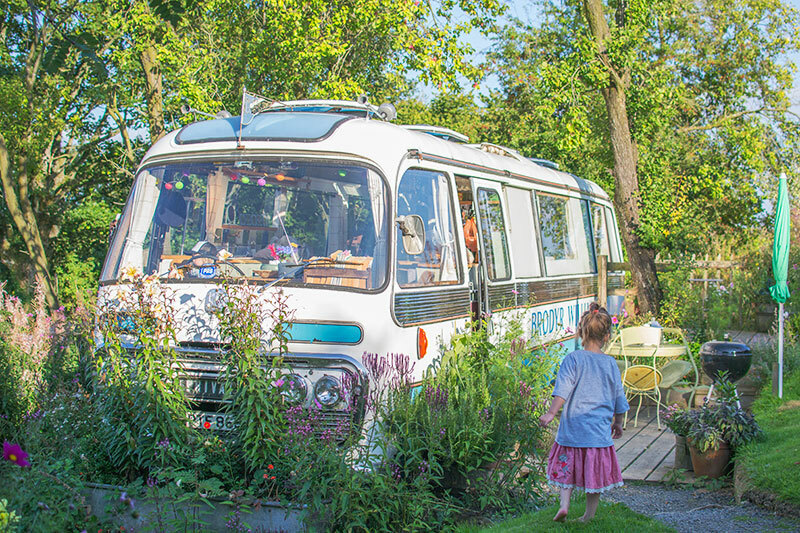 We had a great time on our two trips away, the first was to stay on ‘The Majestic Bus‘, an old Bedford bus that had been renovated into a living space. On the way home we stopped off at Dismaland as we had managed to get tickets, there were certain parts we didn’t take Cherry in as we didn’t feel they were suitable but she loved walking around the rest of it and asked lots of questions. Our second trip away was to Lake Windermere in the Lake District, it is unbelievably gorgeous up there and we were so lucky with the weather. The kids even got to paddle in the lake one day. We went to visit a National Trust place called Wray Castle during our time there, if you are ever in the area then I would definitely recommend it as it was so good for kids. They had two rooms full of props and fancy dress as well as a little wooden castle stage. They also had a crafting room, one where you could draw, build a foam brick castle and a stone wall, in fact I’ve never come across a NT place so geared towards kids which was great. Then over the last couple of weeks we’ve been doing lots of activities at home. We did start back at Fun Science which Cherry loves, the first session was all about air pressure and we did some fun experiments then the kids got to make a barometer to take home. Cherry was doing the experiments with a couple of older boys and I always love the way they all work so nicely together, age isn’t an issue. One of the reasons we decided to homeschool was because we didn’t feel like mainstream schooling would suit Cherry, she is a really creative learner and I knew putting her into such an academic environment wouldn’t be enjoyable for her. She is making progress with learning to write, all at her own pace, but she will only manage a few minutes before asking to do some painting or crafting which she will then do for hours. She comes alive when doing it too which is always lovely to see. Tiger usually does it for a few minutes before getting bored, his favourite part is squeezing the paint out onto a plate! We’ve learnt about the five senses this month and talked about the different taste sensations. And as Halloween / Day of the Dead get closer we’ve been doing lots of themed crafts and activities. We made these sugar skull pizzas the other day out of pitta breads and tomato puree. Then these dangling Hama Bead eyeballs which we also combined with learning about the different parts of the eye. I showed Cherry how pupils change size by holding my eyes shut then opening them with her watching. She loved that! And some sugar skull bunting too, Cherry spent hours making these and got through two whole packs of the foam skulls (£1 from Hobbycraft). Then lastly there has been lots of playing, I know there is nothing surprising about that as kids love to play but I wanted to add it in as it’s an important part of what we do. We don’t have set times for learning or playing, they are free to play whenever they choose so if we are doing an activity and they get bored then it’s no problem for them to get up and do something else. I’ve really enjoyed watching the games they play develop too, Cherry typically leads them then they both do the same thing but one with dolls and one with cars (they’ve always had all toys on offer but have just steered towards those!). They’ve been playing with these Plus Plus Bricks a lot too, I hadn’t heard of them until recently but they make a nice change from normal bricks. So that is a rather long round up of what we’ve been doing this month!